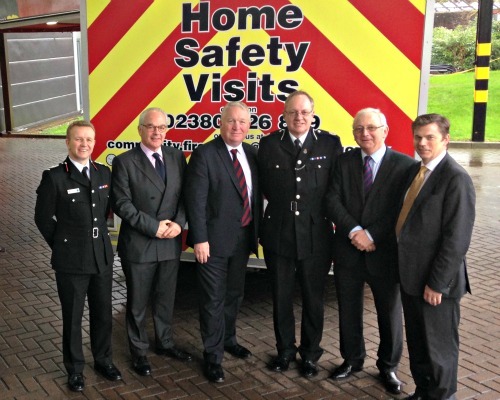 Police and Fire Minister Mike Penning visited Hampshire Fire and Rescue Service (HFRS) and Hampshire Constabulary’s joint HQ on Leigh Rd, Eastleigh. ​The Police and Fire Minister met with senior Hampshire fire and police staff. ​Mr Penning was welcomed by Deputy Chief Officer Neil Odin and Assistant Chief Constable David Pryde, as well as meeting Police and Crime Commissioner for Hampshire and Isle of Wight Simon Hayes, and Hampshire Fire and Rescue Authority Chairman Chris Carter during the visit. ​Mr Penning was able to see at first-hand senior police staff sharing the Eastleigh joint HQ with their Hampshire fire colleagues, and to hear about the close collaboration between the organisations – which also includes police and fire colleagues sharing five fire stations across the county. ​The two organisations showcased some of their nationally-leading collaborative work and Mr Odin also briefed Mr Penning on HFRS’s co-responding medical work with the South Central Ambulance Service. “We were delighted to be able to host Mr Penning and it has been good to see Hampshire’s collaborative blue light working highlighted by the Home Office this week. The visit enabled us to have some productive discussions. ​“Greater collaboration between the emergency services in Hampshire is making HFRS more financially efficient, and initiatives like the HQ share are making our county’s fire and rescue service a stronger organisation, working with partners to do the very best we can for our communities in Hampshire and making them safer. “Hampshire Constabulary has been working in partnership with the Fire Service, both in Hampshire and on the Isle of Wight, since 2012.